"Warning...don't lean back on the toilet while pregnant." Jessica Simpson is currently pregnant with her third child — a little girl who's reportedly already been named Birdie. Jessica is also mom to Maxwell, six, and Ace, five. And over the past few months, Jessica has kept followers informed of the physical changes she's experienced with this pregnancy. 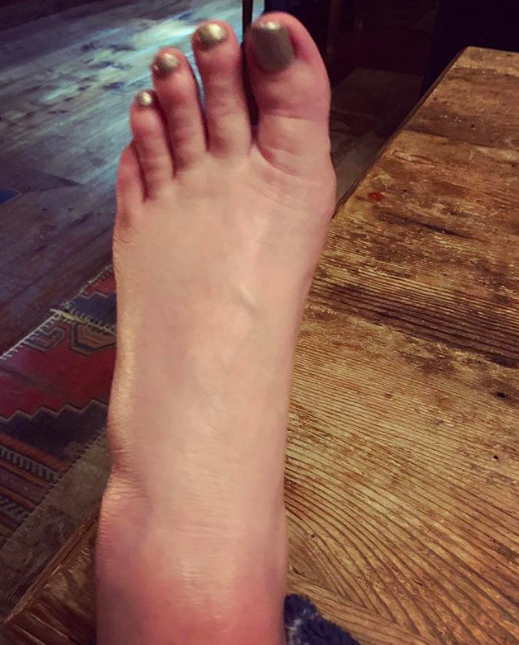 A few weeks ago she shared a photo of her swollen feet, begging fans for remedies that might help. She eventually resorted to cupping which seemed to provide some momentary relief. But now she's revealed two more pregnancy-induced problems. The first — acid reflux so severe she's had to invest in a reclining chair to sleep in. Jessica shared a photo of herself in the chair alongside a crying laughing emoji. People in the comments were quick to express sympathy for Jessica, as well as homemade remedies that might help her acid reflux. But that wasn't all! Jessica went on to share a second photo, this time of herself holding a toilet seat. And in the caption, she explained what had happened. This time, people were laughing with Jessica, and praising her for being so real and honest about her pregnancy. And, finally, Jessica also shared a photo of herself getting somewhat stuck between two cars, alongside another hilariously real caption. Let's hope the last few weeks of pregnancy fly by for Jess!